The Raspberry Pi foundation has made a new Raspberry Pi computer called the PiZero. It's a smaller version of the version 1 Raspberry Pi that's been stripped back to the bare essentials with price that's an amazing $5 (currently £4 in the UK including VAT). Not only that but they are so inexpensive they've been giving it away with print copies of The MagPi magazine (priced just £5.99). As you could predict this was an immediate success with the magazine selling out within a matter of hours in most places and most UK resellers selling out by about lunchtime. This has been picked up by the UK press and all over social media most of which have been understandably focusing on the price. It's completely understandable why the price would be dominating the headlines. This is a huge achievement and brings the cost of a computer down pocket money size for children who may otherwise be excluded from the fun of computing and programming. The fact that they were then able to give the computer away with a magazine is something I'm still trying to get my head around. If someone had told me 5 years ago that in the future computers would be so cheap you would find one free with a magazine I'd would have probably laughed in their face. The computer may not be particularly powerful (the Raspberry Pi 2 will significantly out perform the PiZero), but it still has the same processor as the original Raspberry Pi and whilst you wouldn't use it to replace a modern PC it's a great little computer. But there's more to it than just the cost. When the first Raspberry Pi was made available then the cost was a significant factor in it's success, but so too was the GPIO header. This connector provides a way to add add-on boards or to connect your own electronic circuits to the Raspberry Pi. This was a real game changer, it made it possible to connect a computer direct to the physical world in a way that was not possible before *. The PiZero still has the GPIO ports, although it doesn't have any header pins. Fortunately it's not too difficult to solder header pins on the board. See my video guide to soldering the GPIO header pins onto the Raspberry Pi PiZero. The big think about the PiZero (or rather the significant small thing) is the size. It's much smaller than the previous Raspberry Pi. This got me thinking back to a session from the PyCon UK education day that I'd attended with my children. The session was called Internet of Toys and was led by Alan O'Donohoe (@teknoteacher). The session was about getting children excited about programming and physical computing through "hacking" toys. The session started with Alan showing off a number of potentially "hackable" toys he'd picked up cheaply from a car boot sale. The thing about the toys is that they were all large enough to have a Raspberry Pi installed into them or could have one connected to them. With the size of the new PiZero then the number of toys that it could fit in is increased greatly. 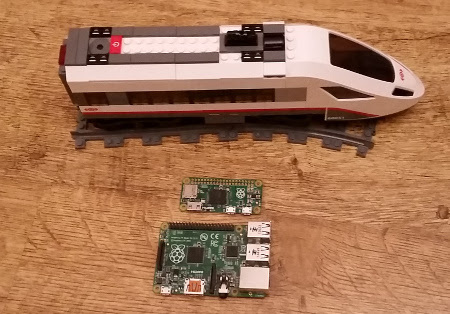 Take a look at the photo below which shows a Lego train locomotive alongside a PiZero and a Raspberry Pi model B computer. Now there is already scope for controlling the train with the Raspberry Pi using infrared (which is something I'm currently working on), but the regular Raspberry Pi is too big to consider including it within the train itself. With the PiZero the board is now small enough to include within the Lego toy itself. The fact that the PiZero is so cheap is remarkable and I see it being really useful for those wanting to get started with physical computing on a pocket money budget. The cost is not the only thing that makes this computer so special. I have some ideas of my own and I'm looking forward to seeing how it will be used by in projects in the future. We live in exciting times for computing. * Arguably the Arduino made this possible before the Raspberry Pi, but needing to use and program a separate micro-controller added more complexity and cost compared to being able to handle this directly from a host computer. In particularly the Raspberry Pi made it much more accessible to regular users.